In 2017, Alaska, Minnesota, and Oregon became the first three states to receive federal approval to establish state reinsurance programs with federal funding via section 1332 State Innovation Waivers, which authorize states to waive key requirements under the law in order to experiment with dif­ferent policies in the individual and small group insurance market within certain guardrails. 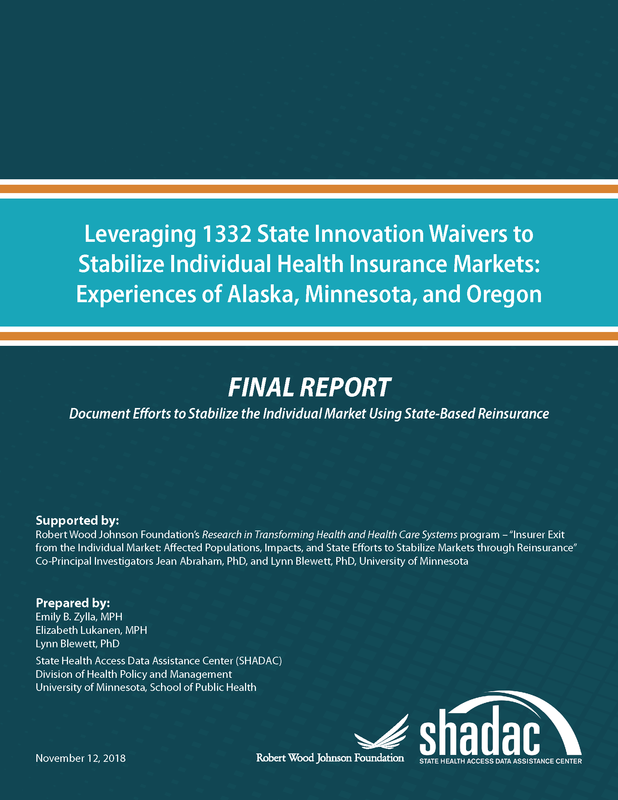 A new SHADAC analysis, prepared for the Robert Wood Johnson Foundation, examines the use of 1332 State Innovations Waivers to stabilize individual health insurance markets within these states. SHADAC researchers compared the use of this strategy in Alaska, Minnesota, and Oregon, assessing how the 1332 waiver process was navigated; identifying lessons learned about this process and about different reinsurance models; and pinpointing future concerns about the use of reinsurance programs. SHADAC conducted an in-depth document review and qualitative inter­views with individuals - including state agency and executive staff, legislators, actuarial analysts, health plan representatives, program administrators, and other stakeholders - across the three study states who were involved in the design and/or implementation of state reinsurance programs and the 1332 waiver application process. Each of the states faced numerous challenges in their individual health insurance markets (high costs, increasing premiums, shifting marketplace makeup and plan availability, etc.) that led them to establish state-based reinsurance programs. However, as the report details, state policymakers found unique ways to facilitate both the waiver application and implementation processes, including working hand-in-hand with insurance companies, leveraging existing infrastructure and experience within their own agencies, having mechanisms in place to get analysis done quickly, and engaging with the state’s congressional delegation.